Ahh, my first free day from work. I expected to have a million things queued up to make, but this morning, I puttered around a bit trying to figure out something interesting to make. It’s not every day you have as much time as you want to do something creative for breakfast. Luckily, my experimenting yielded something delicious – this Individual Apple Breakfast Cakes Recipe. Things didn’t start out so smoothly. In addition to not having a plan, I also didn’t have a lot of ingredients. I decided to combine pantry items with fresh fruit…the only fruit being apples and bananas. I’ve done bananas a few times, so I turned my attention to the apples. 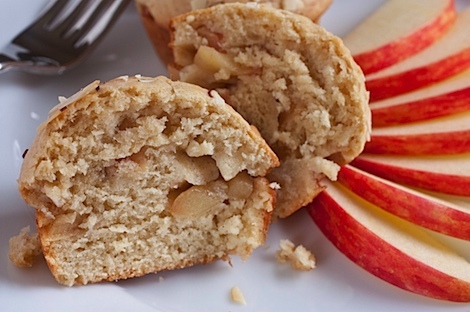 I recently made that quick apple topping, so I chose to do something different…something…baked? I decided to do a play on my apple topping as a layer in a breakfast cake, but individual-sized so it would bake faster. I did something silly and decided to just mix stuff up and see what happened. I crossed my fingers as I put everything together and pushed my creation into the oven. As the timer ticked by, I kept expecting to pull a monster mixture or raw dough or who knows what. To my surprise, the end result was not only edible, but it tasted pretty good, too! Traditional cake lovers may hate this recipe. 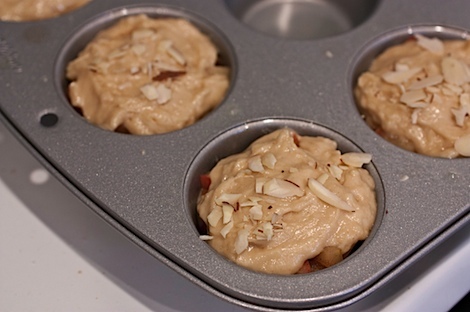 Personally, I don’t really like cakes that are so sweet they give you headaches when you eat them, so this recipe has a lot less sugar than most cakes. This cake is also lacking in the butter department, so it’s not as rich-tasting but still has a nice fluffy texture. If you like richer, sweeter cakes, you may want to up the sugar and butter amounts, though I’m not sure how that would affect the texture. 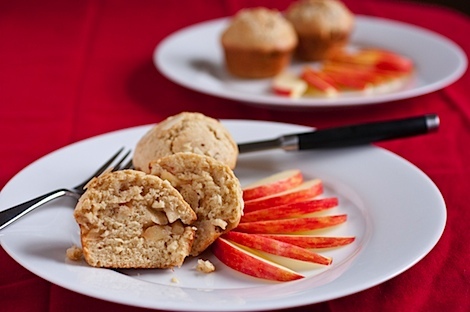 To make extra healthy, try subbing whole grain flours. 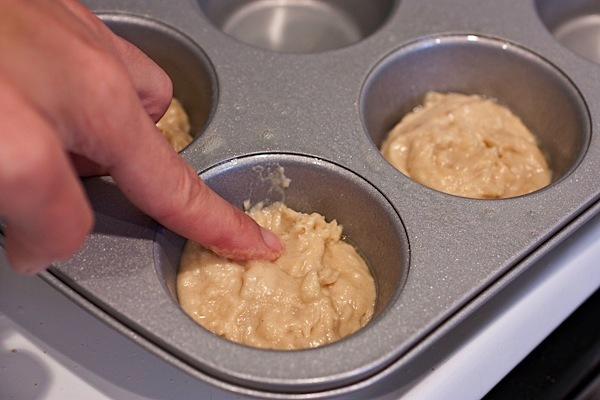 Pre-heat oven to 350 degrees F and prepare 4 cups of a muffin pan with non-stick spray. 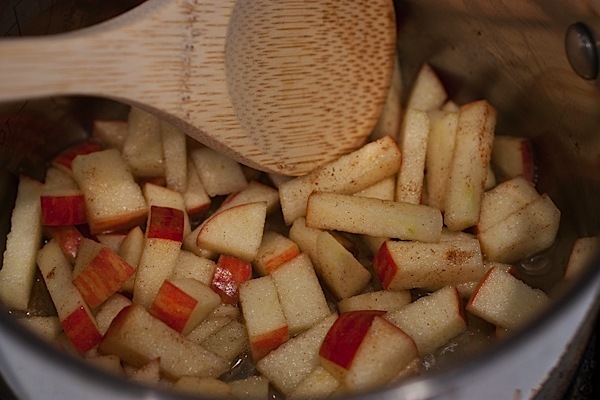 Combine apple, water, maple syrup, and 1/4 tsp cinnamon in a small pot and cook over medium heat for about 5 minutes or till apples are tender. Set aside. Meanwhile, in a large bowl, whisk together flour, salt, baking powder, and cinnamon. In a medium bowl, cream butter and brown sugar. Whisk/stir in milk, egg, and vanilla till combined. Stir wet mixture into dry mixture until just combined, careful to not overmix. 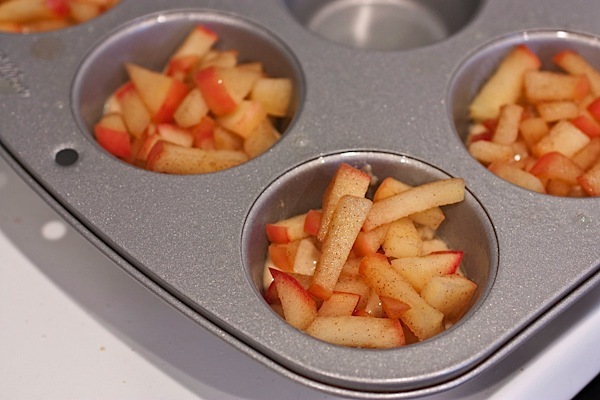 Fill bottom half of 4 cups in a prepared muffin tin with cake mixture. Use finger to smooth to cover bottom. Batter will be a bit thick. Evenly distribute cooked apples into the 4 muffin cups. Evenly distribute the rest of the cake batter over the apples. Smooth/spread as needed. If you’re using a nut topping, add that to the top. Bake for 20-24 minutes, or until a toothpick inserted into the center comes out clean. After breakfast, I worked on some stuff around the house and then met up with Michelle at the mall to get my Christmas shopping. Somehow, I’ve waited till the last minute to buy…all my Christmas presents. Oy vay! 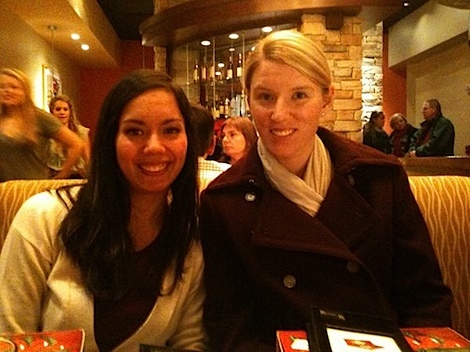 Here are some photos from our shopping adventure…ok just the food. 😆 Excuse the crappy iPhone photos. We first stopped by Banana Republic where they had an extra 40% off sale items till 2pm. I used to love clothes shopping, but since getting the house about a year ago, I’ve cut waaaay back. I’ve been able to restrain myself from buying lot of clothes…till today. But hey, I’ve worked hard this year, so I think I’ve earned a little shopping spree. Especially considering the fab deals I was getting! After BR, Michelle and I broke for lunch at Blynk – the organic food place at the mall. Thank goodness for Blynk! 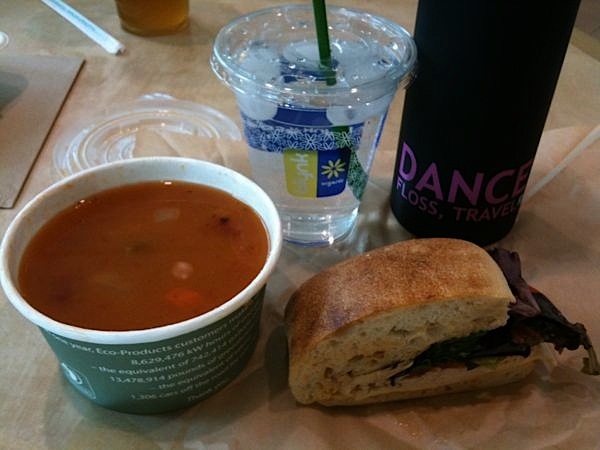 I had a half simple turkey sandwich and white bean soup with water. 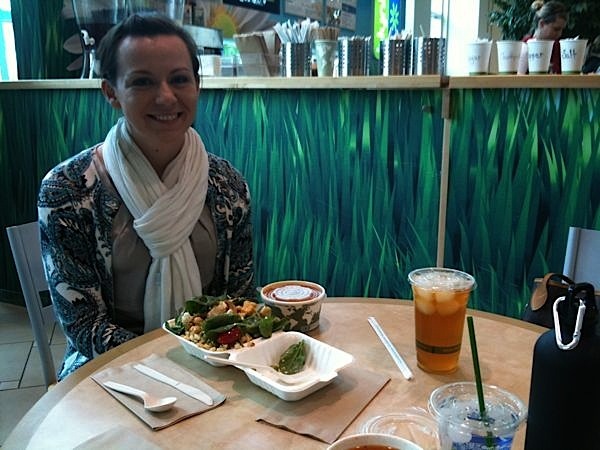 This was way better than your typical food court fare. I loved the soup especially. Then, it was back to the races! 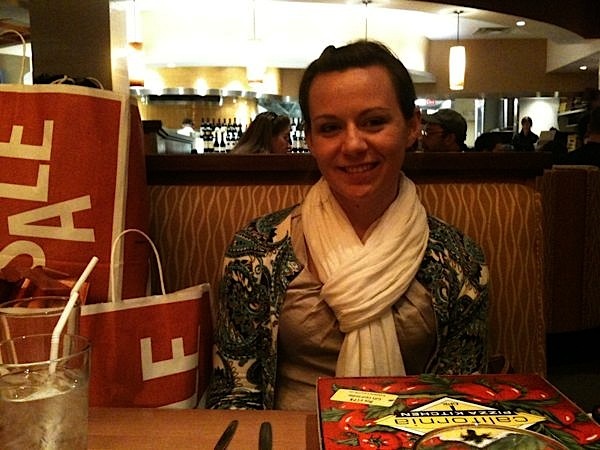 We met up with Jen for the last half of the shopping day. 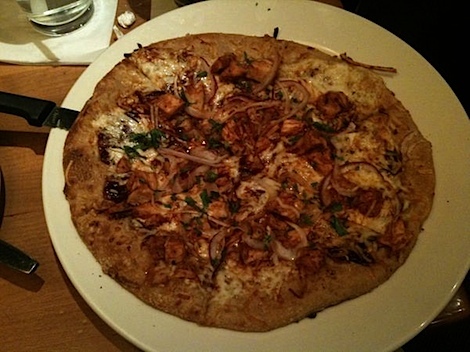 Michelle, Jen and I hit up California Pizza Kitchen for dinner. We split this field green salad 3 ways. 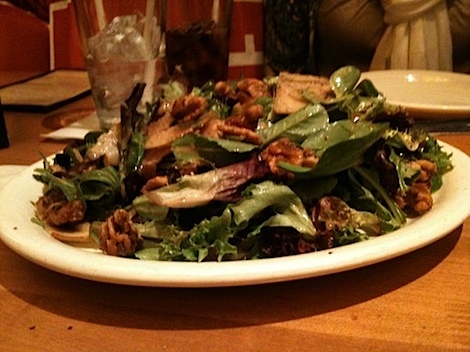 Loved this – from the walnuts to the dressing. And I got the BBQ Chicken Pizza for the main event. I saved half for hubby, which he enjoyed when I got home. We ended up spending almost an entire day at the mall, but I’m happy to report that my Christmas shopping is DONE-ZO! I have a couple wee items to pick up, but the main event is over. Phew! We really did the whole “shop till you drop” thing. I guess that’s the price you pay when you wait till the last minute to go shopping. I was really dreading Christmas shopping this year (the crowds, the craziness!) but it was sooo much better with friends! I actually had a blast! Do you like Christmas/holiday shopping or do you dread it? With the glaring exception of bathing suit and bra shopping, I love any kind of shopping, but Christmas present shopping is my favourite! I need to stay away from town now, though, because even though I technically finished my shopping weeks ago, I’ve bought at least one more thing every time I’ve ventured near the stores since. 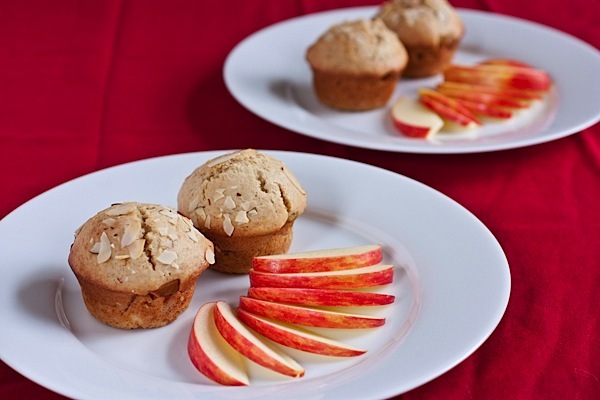 Great idea with the muffins. Christmas shopping with friends is always more bearable. Glad you had a great day and it was better than you anticipated. how fun! i’m so-so on christmas shopping. i love getting gifts for people but the crowds stress me out, so i like to spread it out over weeks and do some online shopping too. it’s the crowds for me too! 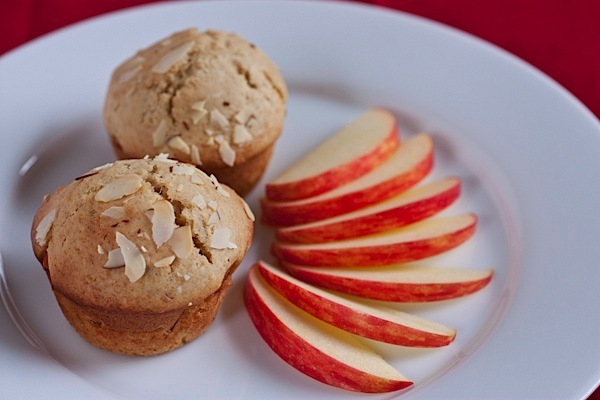 Oh my goodness, those apple muffins look delicious! And I love that they have real apple pieces in them! I made your chocolate chip dough ball recipe and they were fab! I am going to link to you in one of my upcoming post, thank you! And I bet you had fun shopping with the girls! That looks WAY better than my breakfast. I believe in breakfast. Ok, I also believe in lunch, dinner, chocolate and homes for all doggies in the world. I hope you have a wonderful time these next couple weeks Diana! I dread Christmas shopping at the mall. I try to go when there are least people around! same here! i like to go when i think other people won’t be there! Ah yes, I think we have realized our mutual passion for not-so-sweet baked goods before! I just think too much sugar takes away from all of the other great flavors in foods (and, like you said, I don’t end up feeling very good afterward). These look awesome, I bet I would love them! Those muffins look creative and yummy, as does your pizza! To answer your question, no I do NOT enjoy Christmas shopping so did most of it online this year. That is a busy day of shopping! But those yummy looking muffins must have kept you well fueled! I hate shopping for the holidays because it is so much at once, but I love seeing people get excited about their gifts.